On Wednesday Isabel and I headed over to Monticello to set up for the Fall Sale going on this weekend. We were there almost four hours trying to make everything fit in our special space and look pretty. Since it is a Fall Sale, most of the vendors had items in Fall colors, rustic pieces perfect for fall decorating. Us, not so much. 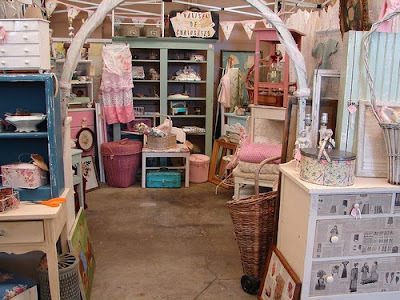 We basically had what we always have, shabby chic pastel or white items. In our haste to finish up and get home, I forgot to take pictures. Fortunately Joyce at Monticello took one so here it is. The sale started on Friday and goes through the weekend. Our space will be set up for a whole month. As if that wasn't enough, next weekend we are having a "Vintage Stuff" Sale at our friend Mitzi's house. We did this sale in the spring, but since we still have a lot of stuff to get rid of, we are doing it again. After the success of last weeks trip to the Goodwill outlet, I decided to go again and was so glad I did. In addition to finding great stuff, this is also a great place to people watch. You get everyone from Mom's with kids to Men who are probably there looking for stuff to sell on ebay. Regulars will stand around and chat. I like to go it alone, that way I can stay focused on my hunting for treasures. It's also fun to see what other people have in their baskets, that is if their baskets aren't covered up with a blanket like so many are. In the spirit of Halloween coming up, I thought I would show you what one guy had in his cart. So funny. 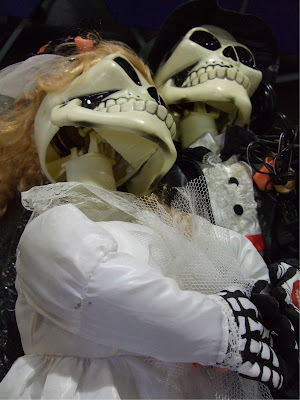 Not really something I would want to add to my bride and groom collection though. ha ha The same guy also had a three foot tall vintage Santa in his cart as well. In case you were wondering, I did ask permission to take a picture first. I'm sure his thought I was wacko, but I just thought it was so funny. While shopping there I ran into this guy. His name is "Tam the Cap." At least that's what he told me. I had met him at the July Expo Isabel and I did. 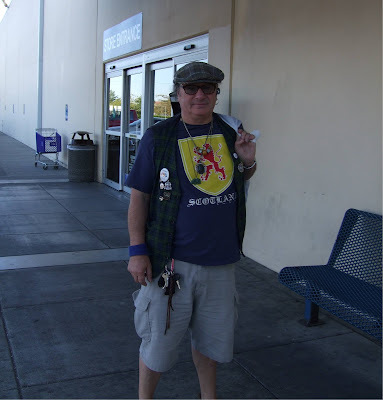 He was a dealer there too and had some Elvis stuff for sale. I had told him about how I'm related to Elvis and we had a nice chat. He is Scottish and has a very thick accent so it was hard to understand everything he said. He only had a few items and since they charge by the pound and the more you by the less the price per pound is, I let him add his stuff to mine so he could get it cheaper. Now, I suppose I should tell you what I found there. Well, even though I told myself that I have way too many linens and they are not always the easiest to sell, I found some fabulous linens. A lot of them. I just couldn't pass them up. 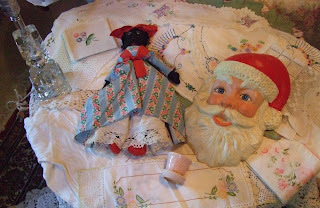 Several embroidered runners all rolled up on a cardboard roll, pretty doilies napkins, a fabulous crocheted table cloth, two down pillows, a pair of jeans for me, an itty bitty pink flower pot (it has a big chip, but I didn't care, it's still cute), vintage etched glass lamp, plaster santa face and a cute vintage doll. I'm sure I'm forgetting something, but that's mostly it. Oh I did forget something. 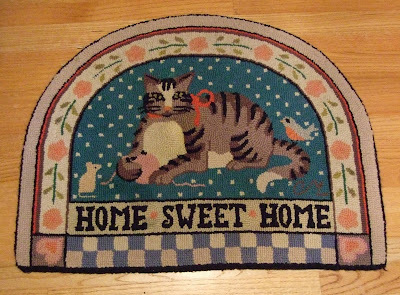 This cute wool hooked kitty rug. It is already at Monticello in our special space. Hopefully some kitty lover will see it and have to have it for their own. On Thursday morning I woke up with a nasty cold so I didn't do much. I'm still suffering a bit with a drippy nose, but I'm feeling a bit better. Friday, I felt up to hitting some garage sales with my pal Andrea. We found a trailer park that had sixteen sales and I was very pleased with what I scored . I think I spent a total of $20 at sales. Everything was really cheap. Here's my Friday haul. 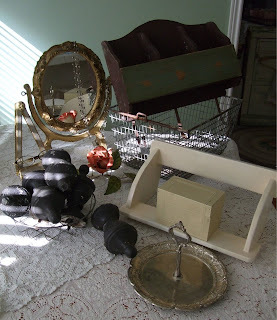 Two pink wood shelves (not pictured), old locker basket, italian gesso mirror, oldish tole rose, little italian easel, six old wood finials, some white painted wood for shelves, little book shelf/holder, cute metal recipe box, metal necklace, silver snack caddy and some Donna Karen glasses. Everything you see here will be headed to Monticello today. I'm going to take a load over, clean up our spaces, rearrange and pick up some of my older stuff for our sale next weekend. Well, that's it for today. On my next post I'll share with you my day out shopping my my sweet girl. Lots of housework and projects to work on this week. Can't wait! Your booth looks fantastic! I know I keep saying it but I really want to get down there! Great finds! Not only did you get some great stuff but it looks like you have a new buddy. Sooo wish I could come shopping at your booth Lisa! what gorgeous finds you have! Can you tell me, do you have a website or sell any of your stuff. It is all amazing. Loved to hear from you.